The Skinny: Inconsistent family comedy/drama that alternates between delightful and alienating. The actors are strong, as is Peter Chan's direction of them, but the film as a whole struggles to cohere. This film from Peter Chan is a perfect demonstration of the notion that Hong Kong Film is a cinema of moments. His fantasy/comedy/drama is both touching and alienating, and only works some of the time. Usual leading lady Anita Yuen dons [unconvincing] old woman makeup to play an elderly woman struggling with her mess of a family. Alan Tam is her eldest son, a mama’s boy who desperately wants to cut the strings, and has plans to emigrate to the U.S. - without mom. Her eldest daughter (Teresa Carpio) has multiple kids from multiple fathers and she’s come home to annoy everyone with her brassy personality. Finally, her youngest son is a shy, seemingly slow fellow played by Jordan Chan. 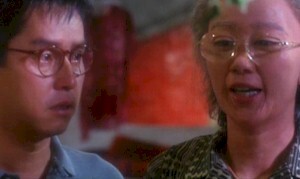 Anita runs into Death (appearing in the form of a kindly decked-in-white Roy Chiao), who informs her that her time is up. She pleads for more time to realize the happiness that she seems to have missed. It seems she bartered ten years of her life away when she was a young mother and Alan was near death with a vicious fever. Her prayers were answered but she’s supposed to check out ten years sooner than normal. Nevertheless, he gives her a short time to put her affairs in order. The fact that Death lets her slide bespeaks implications that are never fully realized. Furthermore, Anita gains strange powers after meeting Death, leading to lots of fantasy/magical weirdness that adds to the odd flavor of the film. A lot of the film is touching, but at the same time there are so many emotional crescendos that you’ve got to wonder when it’s all going to stop. The script is incredibly creative yet also so conscious of itself that getting lost in its magic may be difficult.